The first time I saw this beautiful Appaloosa filly was at the Rodeo City Equine Rescue spaghetti fund raiser. She was pictured on a placard that was placed on all of the tables. I couldn’t take my eyes off of that picture all night. I just knew she was something special. But she wasn’t available for adoption at that time and I wasn’t looking for another horse. Then months later, I saw a post from Rodeo City Equine Rescue that she was now available for adoption. After thinking about it for a few hours, (ok minutes really), I contacted RCER to make arrangements to meet her. I just knew she wouldn’t last long. At that time she was approximately 18 months. Needless to say, the meeting went well and she soon came home to become a part of our family. After some transition time to blend in with my herd, I started working with Rane. She was very reactive and even a bit dangerous to work with at first. I realized early on that she was going to be high spirited and would require a lot of attention. When she was 2 ½ years old, I started ponying her on trail rides. 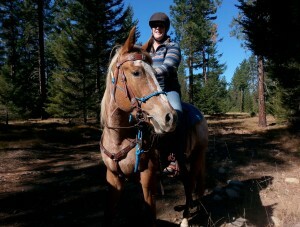 She was so amazing and calm on the trails. I then took her to Mark Bolender Horse Park to introduce her to trail obstacles and ended up putting my first ride on her that weekend. Her confidence and grace grew ten fold that weekend. I was so proud of her. She was so easy to ride and amazingly enough, very NON-reactive when in the saddle. She didn’t spook or shy away from anything. Rane just turned 3 years old. I’ve been riding her very lightly since our first ride at and she continues to amaze me. She is pushy, opinionated, stubborn, and impatient, BUT she is also extremely smart, sassy, spirited, and sweet. I love this little girl beyond belief and feel so lucky to have found her. I will continue to give her the means to be a great horse and can’t wait until she tells me what she hopes to become. Thank you Rodeo City equine Rescue for bringing this special girl into our lives.